There are six routes for all abilities of cyclists and their families. For those up to the challenge of the climbs, there are routes of 24, 44, 62, 84 and 100 miles, extending up to the 126 mile Ultra with 11,733 feet of climbing! The Chief Ladiga Cruise is kinder, gentler family style ride that offers distances of 12, 25 or 50 miles on the Chief Ladiga rails-to-trail. There will be Rest Stops on the course, which is all on the paved bike path through Alabama's countryside with Dugger Mountain as the backdrop. All rides start and finish on campus at Jacksonville State University. Jacksonville is known for its mild temperatures, clean air, and blue skies, and is located in the midst of four mountains. Nearby is Cheaha State Park and Mount Cheaha. The Cheaha Challenge has a lot of specialty additions accompanying the rides; Live bands, buffet food, $3,250 dollars in prizes, and Team and Individual Awards. The Rest Stops are amazing, and they hold a contest as to which feed station is the best. For spectators, there is transport to the top of Alabama, where the first KOM ends. There are three KOM/QOMs competitions. One on the Century/Ultra course and two additional ones just on the ULTRA. The events boasts an incredible 11 timing points to keep the integrity of the ride at its best. There are chances to win the coveted KOM/QOM jersey and cash prizes for 1st, 2nd and 3rd place. There are also cash prizes for 1st, 2nd and 3rd in the overall Century and ULTRA. Again up to $3,250 dollars of prizes are on offer. 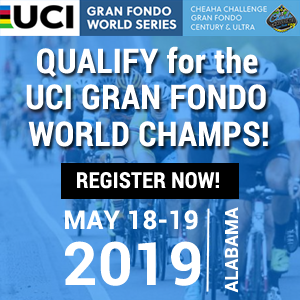 If you finish in 1st, 2nd, or 3rd place or in the top 25% of your age group in the Century ride, you will qualify for the 2019 UCI Gran Fondo World Championships and a shot at the World Champions Rainbow Jersey! The 2019 World Championships are being held at the Poznan Bike Challenge in Poznan, Poland September 5-8, 2019. 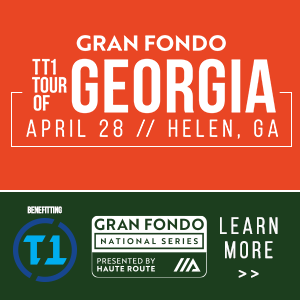 It’s the 100 mile century route that is the UCI Qualifier, and features 9,714 feet of climbing in the Talladega Mountains. The UCI Qualifier draws riders from across North America and Internationally. As well as the Gran Fondo, there is the Time Trial World Championship, a true race against the clock. The event includes a 12 mile time trial to allow you to qualify for the UCI Time Trial World Championships. 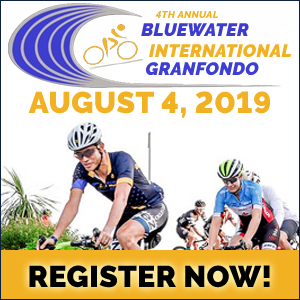 For those looking to take part in the UCI qualifiers, the age groups are 19-34, 35-39, 40-44, 45-49, 50-54, 55-59, 60-64, 65-70 and 70+ and are determined by the cyclist's age on Dec. 31 of that year. No racing licence is required to participate in qualification. 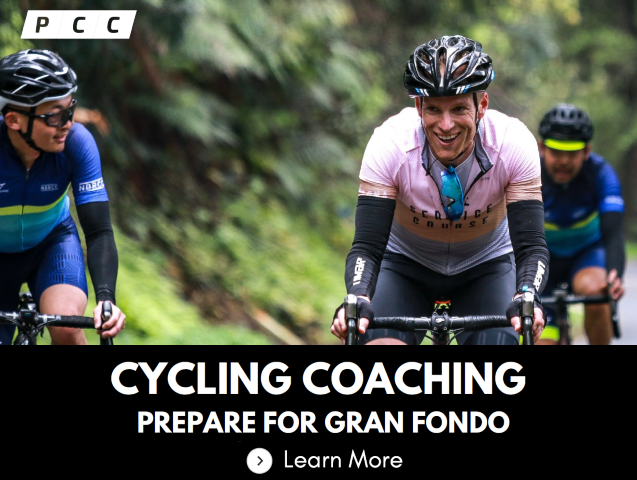 For more information regarding the UCI Gran Fondo World Championships, please go to: http://www.ucigranfondoworldseries.com. UCI Qualifiers will be automatically invited to register in advance. Every entrant receives a huge amount benefits for their entry fee, which includes; Pre-ride dinner (discounted tickets) and band party, Goody Bags, Pre-ride breakfast, Post-ride party, Fully stocked Rest Stops, Law enforcement support, Medical support, SAG and technical support, Official custom number bibs, Professional Timing, Custom Finisher Caps, Custom ride t-shirts, ULTRA Finishers receive a custom Finisher Shirt, Finisher medal for Cheaha Challenge Century and ULTRA riders, Finisher gift and hot showers at the finish! Proceeds from the Cheaha Challenge & ULTRA go to maintaining local trails – Chief Ladiga Trail, Black Creek Trails, Coldwater Mountain Trail, and to fund a grant program for the local High School Mountain Bike Teams. Register now save, prices go up March 2nd!